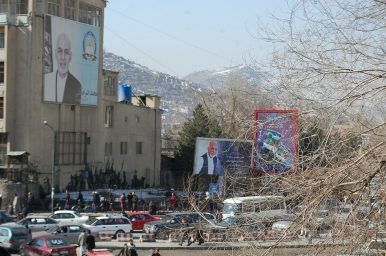 Billboards with the image of President Ashraf Ghani in central Kabul. Concerns are growing that Afghanistan’s government will not survive an eventual U.S. withdrawal. KABUL — Mir Ahmad Shah Timory graduated from Literature Department of Kabul University in 1973, the same year Mohammad Daud Khan seized power in a coup and declared a republic. In 1975, Timory joined The Kabul Times, a government English-language newspaper, to report on government institutes. As it turned out, the government Timory was hired to report on lasted only five years. The 70-year old editor has survived serving different five states, first as reporter then as an editor — four of the states he worked for collapsed, with the current Afghan state the lone exception. Timory edited stories on how the communists toppled General Daud Khan’s government in 1978, the Mujahedeen overthrew the communist regime in 1992, the Taliban group defeated many political parties to take control of the country in 1996, and finally the U.S.-led collation forces toppled the Taliban group to build Afghan state. Timory now edits stories on two ongoing peace processes, but the state has been sidelined in both. In one, Zalmay Khalilzad, the U.S. State Department’s special envoy for Afghan reconciliation, has led several rounds of talks with the Taliban group. In the other, influential Afghan politicians set out to talk with the Taliban group in Moscow; another meeting will be held again in near future. For the second round of negotiations in Doha, Qatar, Khalilzad held talks with a Taliban delegation led by Mullah Baradar, co-founder and deputy leader of the group, who was recently released from Pakistani detention. The issues under consideration were a Taliban agreement to keep Afghan territory free of terrorists wanting to attack the United States and its allies, and the United States’ withdrawal of its troops out of Afghanistan. The Taliban’s current promises – to keep terrorists out of Afghan territory — seem not enough to prevent another scenario of state collapse in Afghanistan. The United States’ hopes for a full-fledged democracy in Afghanistan have faded away and Washington now seeks withdrawal, a move that has increased fear over yet another collapse of the Afghan state. But the group may be dangling that promise to seek its own ultimate goal. “All efforts of the Taliban are focused on a full U.S. and NATO troop withdrawal, which will enable them to break the stalemate and to overrun Kabul militarily,” says Aziz Koshan, a Kabul-based researcher. However, while the Taliban negotiate with the United States in Doha to shape Afghanistan’s fate, Afghan political leaders are falling apart in Kabul. Koshan argues that as a democratic state where the legitimacy of the government being drawn from the people, the government is obliged to consult with the Afghan people on national issues. That’s the logic behind the call for the Consultative Loya Jirga — Traditional Grand Council — next month. The council would include about 2,000 Afghan representatives from across the country to provide advice on how to move forward. Mohammad Umar Daudzai, Ghani’s special envoy for peace, said he hoped that the meeting would create consensus. Gulbuddin Hekmatyar, leader of Hezb-i-Islami, which signed a peace deal with the government in 2016, said during an interview with a local television that formation of an interim government would be an option to achieve peace in the country. Hekmatyar, who fought against the government for 16 years, added that he had as many as “10,000 armed men in the country” who could begin fighting if they were “forced” to do so. The country’s fractious elites still put forward their personal interests instead of national interests. At this movement, they have failed to stick with the state, built through a high price in blood from ordinary Afghans. 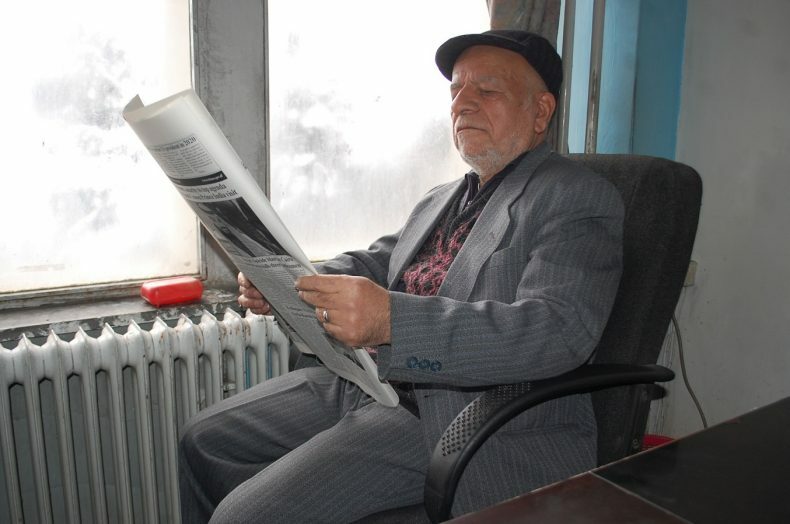 For the last 40 years of ups and downs in the history of Afghanistan, Timory, still an editor at the crumbling building of The Kabul Times, has remained committed to the state – even as the state itself constantly changed. Ezzatullah Mehrdad is a freelance journalist based in Kabul. His work has appeared in The Diplomat Magazine, South China Morning Post, Times of Israel, and many more.